Looking for a fun new weeknight meal? 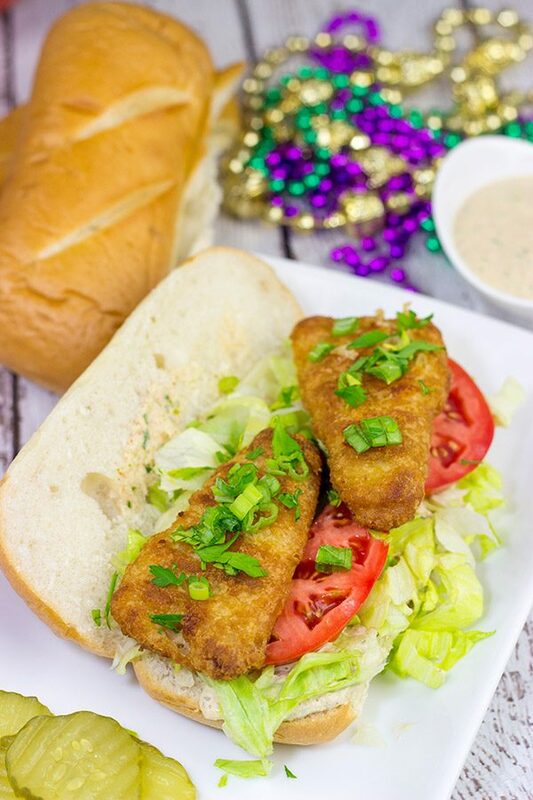 These Beer Battered Fish Po’Boys are packed with flavor, and they’re ready in less than 30 minutes! Disclosure: This Beer Battered Fish Po’Boys post is sponsored by Gorton’s, but the recipe and opinions are entirely my own. Thank you for supporting the brands that support Spiced! 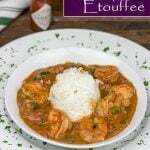 I’ve had a serious hankerin’ for Cajun food lately. I always crave Cajun food in the winter around Mardi Gras, but I’ve been thinking about po’boys lately. Have you ever had a po’boy? If not, then put these Beer Battered Fish Po’Boys on the menu soon! When I moved down to Baton Rouge, Louisiana after college, I’d never heard of a po’boy. It didn’t take long before these sandwiches raced to the top of my list of favorites. 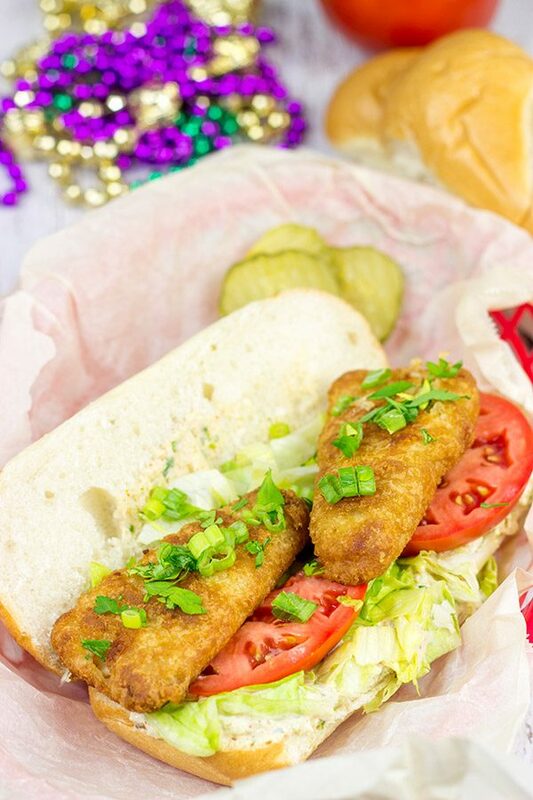 Typically served on a loaf of French bread, a po’boy is Louisiana’s version of a sub, hoagie, grinder, etc. While southern Louisiana is certainly known for it’s impressive foods, the po’boy is a much simpler fare. But that doesn’t make these epic sandwiches any less impressive! On most nights, we only have 30 minutes to pull dinner together. I don’t know about you, but after a while, I begin to run out of 30-minute meal ideas. So last week, I decided to try my hand at making these Beer Battered Fish Po’Boys here at home. Woah! I started with a batch of Gorton’s Beer Battered Fish Fillets and then went from there. 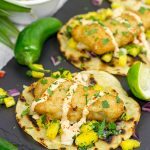 We’re big fans of Gorton’s around our house, and these Beer Battered Fish Tostadas with Pineapple Salsa have made several appearances since I posted the recipe earlier this summer. So much flavor! 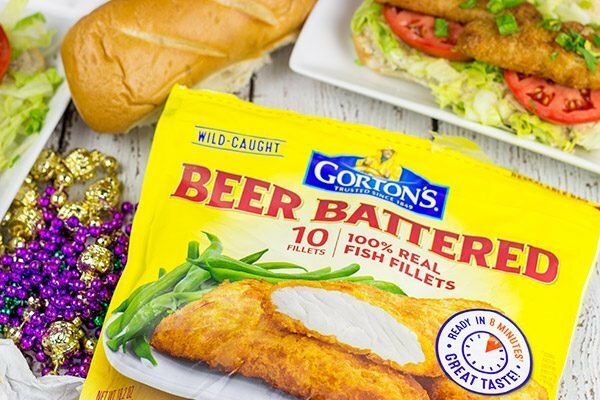 In fact, we’ve started keeping Gorton’s Beer Battered Fish Fillets in our freezer at all times…because you never know when the craving for a good po’boy might hit! 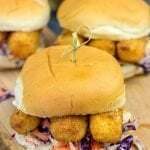 And as good as those tostadas are, I think these Beer Battered Fish Po’Boys give ’em a run for their money! 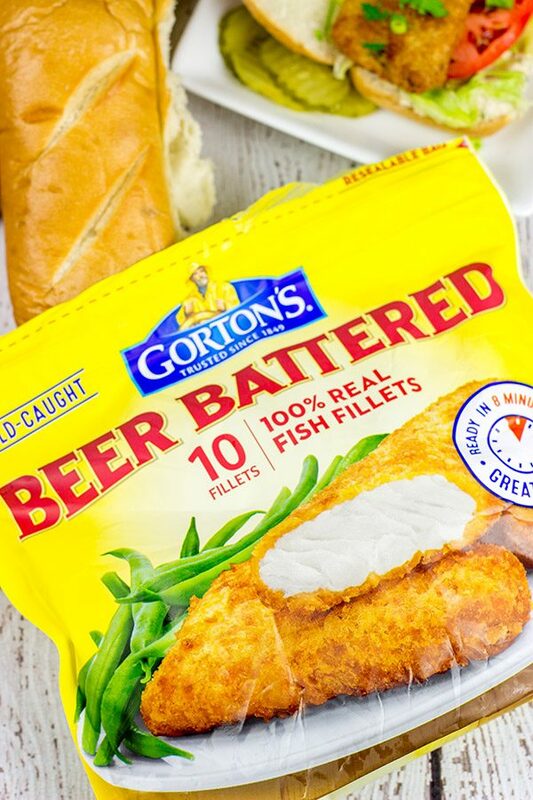 Gorton’s Beer Battered Fish Fillets are made from 100% wild-caught white fish. Add in the crispy beer battered coating, and you’ve got one heck of a tasty fillet. And these beer battered fish fillets are available right in the freezer section of our local grocery store. (Use Gorton’s product finder to find a store near you.) Truth be told: Laura and I have totally made easy fish ‘n chips for dinner using these Beer Battered Fish Fillets. Delicious! But I’ve been craving some Cajun food lately, so these Beer Battered Fish Po’Boys landed on the weekly menu. I could go on and on about how tasty these po’boys are, but I also want to call out how easy they are to make, too. I had these po’boys on plates and ready to eat in less than 30 minutes. Truthfully, you could make the remoulade sauce the day before and that would cut the prep time down even more. 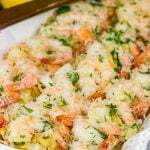 (There’s just something magical about the combination of remoulade sauce and seafood!) For us, a tasty dinner in a jiffy is a requirement for weeknights, and even more so on bath nights. Laura and I enjoyed these Beer Battered Fish Po’Boys while Robbie happily munched on his crispy fish sticks. Then we were off to sing our ABC’s in the bathtub! I hope you enjoy these po’boys as much as we do! If you make ’em for dinner one night soon, snap a photo and tag me on Instagram (@Spicedblog). I’d love to see your version! 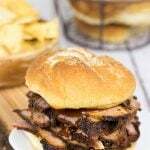 Looking for other tasty recipes using Gorton’s products? Check out these Baja Fish Tacos and these Beer Battered Fish Tostadas with Pineapple Salsa. Both are flavorful and easy…perfect for busy weeknights! Place all ingredients in a food processor or mini-chopper; blend until smooth. Set sauce aside. Bake the fish fillets according to package instructions. Slice bread in half or thirds widthwise (depending on length of loaf). 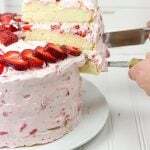 Slice each piece lengthwise. Spread Remoulade Sauce over cut-side of bread. Layer lettuce, baked fish fillets and tomatoes on bottom piece of bread; top with the remaining bread halves. How can you not love a good po’boy? (And must have the pickles.) Our kids don’t sit still so well for reading now that they’re in their 20s, but trust me, the memories will stay with you forever. And you’ll likely raise kids who like to read. Thanks, David. You know, you make a really good point, Bill! I hope Robbie develops a love for reading like I did when I was a kid. Man, I think I always had a book of some sort in my hands. I still do read each night when I can, but I often fall asleep because chasing a toddler around is downright exhausting! 🙂 And, yes, I totally agree with you about po’boys…pickles are a requirement for a legit po’boy. Thanks so much, my friend! Confession: I’ve never eaten a po’boy. But I’ve always wanted to! It’s just that they’re not so easy to come by in my neck of the woods. Thank you for posting a recipe so I can actually make my own! (Also–why have I never thought to google around for a recipe before? I’m too low-tech I think.) These look awesome! David, that po’boy looks mighty tasty. When I’d go to Narlins, the first thing I’d do is hit Acme Oyster Bar for a fish or oyster po’boy, so you’re talking my talk here. I like your Remoulade sauce. Ever try adding a bit of curry powder? It’s a Danish thing. No Gorton’s here, but know them well from my days in the US. I was fond of their crunchy fish sticks. Oh man, I have totally sat in Acme Oyster Bar many times with a smile on my face! Their po’boys are excellent. I must admit that I’ve never tried curry powder in a remoulade sauce. Interesting! I’ll have to try that next time. We’ve done these po’boys a couple of times lately b/c they’re tasty and easy! Too bad you can’t get Gorton’s there in Sweden… Hope your week is going well, my friend! We are huge fans of Gorton’s fish in our home too and I so love what you did with them here, David! Using them with that Remoulade Sauce in these po’boys is such a brilliant idea! And what a quick and tasty meal for busy nights! And – what is this am hearing of Robbie turning three in a couple months??? Feels like it was just yesterday when we were hanging out with baby Robbie at y’alls place! You better tell that kid to stop growing so fast! 🙂 Lil S thrived on routine too – and bedtime reads were her fav…as were Gorton’s Fish Sticks! Happy Wednesday my friend! I definitely have a renewed appreciation for Gorton’s, Shashi! Robbie loves their crunchy fish sticks, and I would guess he requests them at least 2x a week. And Laura and I love their fish fillets. These beer-battered fillets? Excellent! Especially when you put ’em on a po’boy! 🙂 And, yes, Robbie does indeed turn 3 in a little less than 3 months. November 19…it’s coming soon! Hi David! These sound so easy and delicious! I don’t normally buy pre-breaded products, but with your thumbs up I am going to make these! 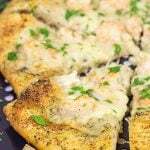 I love remoulade sauce, I use it as a dip for lots of things. Sometimes I’m running on empty by the time dinner rolls around so these are perfect for those nights. 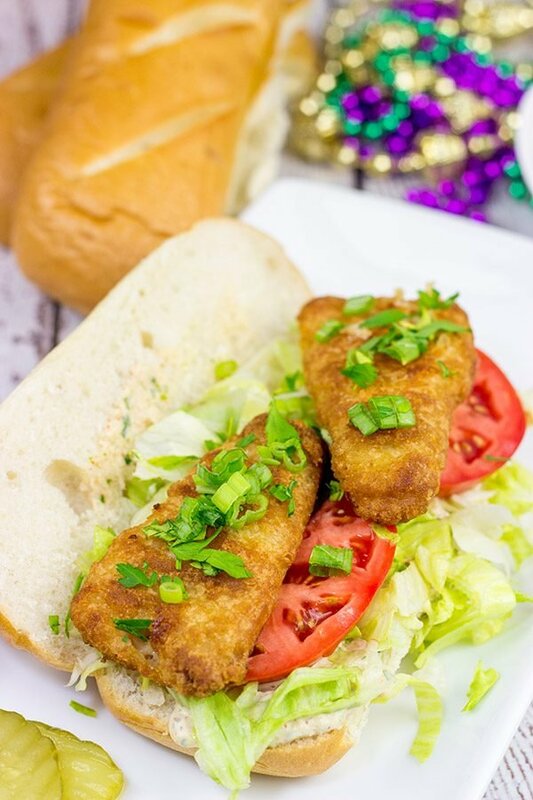 Never even heard of po’boy before – it is always nice to be introduced to something new especially if it looks as delicious as your beer battered fish po’boys (great to have something like this in the freezer, ready to go)! Love your bedtime routine with Robbie 🙂 Have a wonderful weekend ahead, David! So a po’boy is Louisiana’s version of a sandwich. But it’s not just any sandwich. It’s typically some sort of fried or grilled seafood, and it’s served with simple toppings: lettuce, tomatoes and a couple pickles. Oh, and it must be served on a good French bread. Soft in the middle and slightly chewy on the crust. But I hope you can see how all of this comes together to make an epicly delicious sandwich…or po’boy! Put these on the list for whenever you visit Louisiana. 🙂 Thanks, Miriam! I hope you have a wonderful weekend ahead! I couldn’t agree more, Dawn! At its’ core, a po’boy is just a simple sandwich. But it’s really so much more than a sandwich! Once those ingredients come together, the result just makes my mouth water! 🙂 Thanks so much, my friend, and I hope you have a great weekend planned as well. Cheers! I love recipes for a quick dinner. 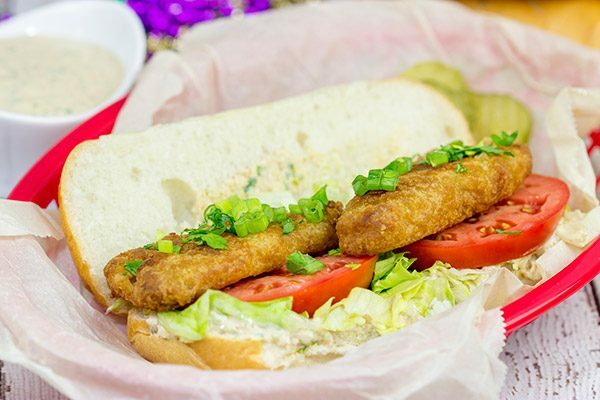 These fish po’boys sound like the perfect quick dinner. I will have to put these on my menu to make. These po’boys really do come together in just about 30 minutes…but they so don’t taste like a 30-minute meal! The combo of flavors here is quite tasty, Dawn. I hope you enjoy these as much as we do! Friday nights are a complete chill out night for us, too, Neil! Sometimes we try to get a quick dinner cooked while Robbie is eating, but sometimes we just wait and enjoy dinner once he goes to bed. He’s staying up later these days, so quick, tasty dinners are definitely more appreciated! And as far as spicy, you could always throw a pinch of cayenne into that Remoulade! 🙂 Hope you had a great weekend, my friend! So I’ve never tried po’boys. Indeed, I’ve never heard this word either. It looks and sounds delicious…like a fish burger with a fancy name 😉 And talking about meals under 30 minutes, that’s the reason we eat a lot of salads. Just make sure to add some proteins to make it satisfying. Po’boys are southern Louisiana’s answer to the grinder, hoagie, submarine, etc. I might be a bit biased, but I’ve gotta say that po’boys are delicious! They’re usually some sort of fried seafood topped with remoulade, lettuce, tomatoes and pickles. Nice and easy…but SO good! Also, can you imagine sitting down and reading a story to your teenagers now? I wonder how that would go over? 🙂 Thanks so much, Kathy!